The Reptile Report - Story submitted by Bryan Minne, Herpetological Education & Research Project. Rony Ryckoort, born in 1957 in Waregem, Belgium has had a passion for animals since he was a young boy. He had a profound love for all of the world’s animals, but his one and true favorite was the tortoise. He started out keeping a few European species as his first tortoises. Among these were the Hermann’s tortoise (Testudo hermanni) and the Moorish tortoise (Testudo graeca). Soon after purchasing his first pairs he had his first offspring. Breeding these magnificent animals gave him a great sense of accomplishment and his passion for tortoises grew day by day. Rony started out keeping larger species as time went on and bought his first adult pair of African spurred tortoises (Centrochelys sulcata) in 1990. When he first laid eyes on these enormous and majestic animals, he fell deeply in love with the species. He sold all of his other non-African species and decided to specialize in African, grassland dwelling species. 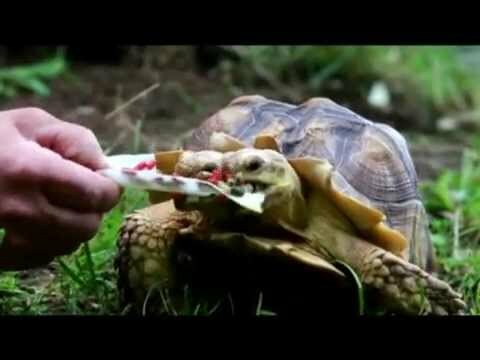 To this day, Rony has dedicated his life to keeping and breeding African species of tortoises and educating people about these amazing animals. His primary focus lies on African spurred tortoises (Centrochelys sulcata) and pancake tortoises (Malacochersus tornieri) of which he has very large groups roaming around his ‘Tortoise room’. His largest specimens of African spurred tortoises weigh close to 220 pounds and are believed to be more than 100 years old. He has a rather large outdoor area, decorated with large rocks, fig and olive trees and a small pond, where all of his adult African spurred tortoises can roam around. A large, heated indoor area provides enough shelter for all 13 of his adult African spurred tortoises. Needless to say Rony has had his fair share of offspring of his animals! He produces close to a thousand baby tortoises every year, which are now scattered all over the globe. On the 28th of May, 2012 a little miracle was born under Rony’s care. A two-headed baby African spurred tortoise, weighing only 0.028 pounds. It was only after a whole day Rony first noticed the tiny hatchling was different then its brothers and sisters! The two-headed baby had a hard time absorbing its yolk sac and closing up its plastron. After quite some time the two-headed hatchling managed to absorb all of its yolk and close up its plastron. Rony chose quite a fitting name for his small miracle. The two-headed wonder received the name ‘Kianga’, an African name, meaning ‘Sunshine’. It was clear to Rony that one of the two heads was a bit more dominant then the other one. It started eating a few days before the second head decided to join in and start eating as well. Up to this day the head on the left remains the most dominant one! It decides where Kianga goes and when it eats. Of course, Rony wanted to be sure his newborn wasn’t in any sort of pain or distress because of her ‘problem’. After all, almost all of the animals born with two heads have some kind of health issue, preventing them from having a painless and normal life. Only very few animals born with two heads are able to live a long and healthy life. In order to find out whether his ray of sunshine was in good health or not, he contacted some of Western Europe’s finest reptile veterinarians to have a close look at Kianga. Most of the veterinarians agreed on the tortoise’s excellent health and decided to wait and see whether the tortoise would grow, eat and in general ‘live’ as it should, before taking any more steps. Rony dedicated his everyday life in assuring Kianga got the best care possible. He even slept in a sofa for over a year after her birth, checking up on her every few hours to ensure nothing happened to her. Three years passed until Rony made the decision to get all of the experts back together to perform an entire body scan of the three year old, two-headed tortoise. The scan revealed incredible results and an insight to why she was able to thrive with her malformation. Kianga’s only malformation is situated in her spinal cord, just after the neck. The spinal cord has a ‘Y’-junction, allowing her to have two heads each with a perfectly formed brain and cervical spinal cord, two tracheas leading to one set of normal lungs, two esophagi leading to one normal sized stomach and one beating heart! In short: only Kianga’s heads and necks are doubled, the rest of her body is as normal as the body of any other tortoise. Experts believe Kianga will probably live a long and happy life. With Rony’s excellent and expert care, she will surely outlive him and maybe even her next caretaker! Today Rony’s goal is to show Kianga to the entire world. He has started out with showing this beautiful freak of nature to audiences all over Belgium and the Netherlands with the help of the H.E.R.P. (The Herpetological Education and Research Project). This organization, lead by Laura Ruysseveldt and Bryan Minne, both biologists/herpetologists and professional animal experts, specialized in herpetofauna, focuses on the education of young and old regarding reptiles, amphibians and arthropods and organizes workshops, lectures, summer camps and expositions. As a partner of the organization, he has had the opportunity to show Kianga to thousands of people so far. She has been featured on the news various times as well. He has had many offers of zoos and reptile parks from all over the world, trying to get a hold of the magnificent reptile. But Rony’s love for Kianga is too profound to part with her.